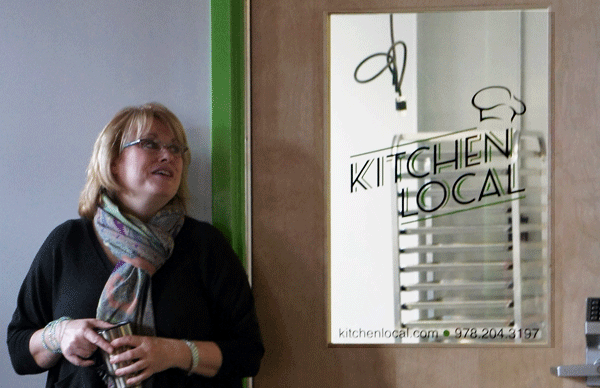 Owner Lisa Sutton explains the inspiration behind Kitchen Local. We recently had the pleasure of touring an exciting new business in Amesbury: a shared-use commercial kitchen called Kitchen Local. Owner Lisa Sutton proudly gave tours of her just-completed space to attendees of the quarterly meeting of The Enterprise Center’s Local Foods Initiative. Sutton said that after seeing the burgeoning local food industry and realizing the shortage of commercial kitchen workspace, she decided to open her own. The 1,200-foot work space is located in 14 Cedar Street Studios, a historic building a few blocks from downtown. Originally home to a carriage and automotive manufacturer, the building now hosts creative entrepreneurs such as artists, architects, designers, builders, and musicians. Kitchen Local is available to chefs, small-scale food producers, farmers, and nutrition instructors for food production, catering, baking, cooking classes, menu planning, training, recipe testing, photography, and product development. 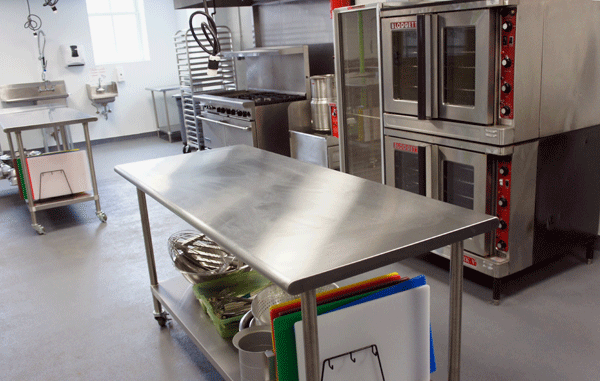 You can rent the entire space for $40 per hour, which includes both the catering kitchen with a six-burner range as well as a baking kitchen with a 30-quart mixer, double electric convection oven, and proofing oven. You can rent one side or the other for $20 per hour. The web site has a complete list of included equipment, plus information about becoming a client (including information on required food safety certification). This is the first certified shared-use kitchen on the North Shore, and the meeting attendees were visibly excited about the possibilities. They also appreciated the protein cookies from Alex’s Whey and cinnamon-sugar popovers from 19 Steps Bake Shop, two of the businesses using the shared space. The Enterprise Center is looking to support the local food community, specifically with regard to manufacturing, shared commercial kitchen space, distribution, and marketing. We’ll continue to keep you updated on the group’s progress.